Splash through a fun day in the sun at Atlantis Paradise Island, one of the most beautiful and action-packed luxury resorts in the Caribbean. Start with an orientation tour and get your map of the 141-acre park, then head out to explore at your leisure. Plus, Royal Caribbean guests who are docked in port earlier in the day will gain exclusive early entrance to the 60-foot, Mayan-inspired Leap of Faith waterslide or brave the 121-foot Power Tower. But here there is something for everyone. 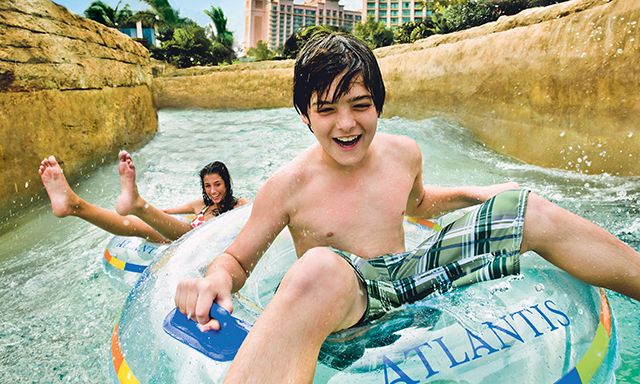 Tube down the 5-story corkscrew Serpent Slide, float down the Lazy River or flutter your way around 20 swimming areas. Then wander spectacular marine life exhibits at The Dig, viewing hundreds of swimming fish and handling sea life in the touch-tank aquarium. Roam at your own pace, sunbathe beachside, try your luck in the on-site casino or shop for authentic souvenirs at Marina Village. After an exhilarating day, take a short walk to the resort’s Coral Towers to meet your scheduled transportation back to port. • Aquaventure: Enjoy exclusive early access to the water park’s thrilling waterslides, rolling river rapids, wave surges and 20 sparkling swimming areas. • The Dig: See hundreds of gorgeous tropical fish through underground tunnel aquariums and meet them up-close at the touch tank. • Free time: Explore at your leisure, recline on the beach, play casino slots, or shop for souvenirs in Marina Village. • This tour is accessible for guests traveling with a folding, lightweight wheelchair or scooter. • Guests must be able to enter/exit the bus without assistance. • Guests needing special assistance should be accompanied by an able-bodied companion. • Pregnant women and guests with back/neck problems should consult their physician before selecting this tour. • Lounge chairs, towels and life jackets are provided. • Snacks and beverages are available for purchase at various venues. • Non-motorized water sports are available for rent. • Only major credit cards are accepted for purchases in Atlantis. • The Mayan slide and pools will open at 9 a.m. and other rides at 10 a.m. for guests who are in port from 7 a.m.-2 p.m.
• The Blu Pool is closed due to renovations until January 2017. • Guests must be at least 48 inches tall to ride the waterslides.